Electronics and Communication Engineering (ECE) is an advancing field with new and emerging ideas. This branch covers a wide range of fields like radio based communications, radar systems, antennas with various ranges, microwave circuits, radio-wave propagation, optics, networking and radar communications, Signal processing and the recent fields like Embedded systems, VLSI design and Nano technology. The department has inaugurated in September 2008 and the students are motivated to propagate and disseminate knowledge in Electronics and Communication Engineering discipline through faculties. The Electronics and Communication Engineering graduates find opportunities in consumer and electronic devices, the terrestrial and extra terrestrial communication systems like telephones, cellular phones, television, optical fiber communication and embedded and VLSI programs research. The department has professors and lecturers who are experts in their disciplines. The department include various laboratories those complement the high standards and sufficient backing of practical knowledge to students. Very Large Scale Integration (VLSI) is the technology of creating integrated circuits by combining thousands of transistors into a single chip. This era began in earlier 70s when complex semiconductors and communication technologies were being developed. This field involves packing more and more logic devices into smaller and smaller areas. The complex circuits that would have taken full of circuit board can now be fitted into a small space of few millimeters. Optical and Microwave Lab is used to enhance their skills in Microwave Communication field. The objective of the lab is to prepare students with a good foundation in communication field so that they become graduate and effective system engineers. The Optical laboratory is well equipped with advanced Optical fiber trainer kits which help the students to analyze the numerical aperture and attenuation measurements and also to measure the analog and digital transmission characteristics. The LED and LASER diode units in the Optical lab are used to measure the Source and Detector characteristics.By using the Trainers, we can develop analog and digital communication link and also used for verification of multiplexing and demultiplexing of signals. The microwave laboratory is equipped with X band bench setups which provide the necessary support for training the students in the area of RF and Microwave engineering. Microwave devices are fundamental to many modern electronics systems, including digital wireless communications. It consists of various microwave benches having Klystron and Gunn diode as microwave sources. By using these benches we can find out various characteristics of microwave devices like couplers, tees, circulators, isolators etc. This lab has also equipped with MIC/Patch antenna pattern measurement setup which provides the necessary exposure for analyzing the radiation pattern of an antenna. Communication Laboratory (Lab) is catering to the needs of facilities in communication field by training its students to make valuable contribution. This lab is equipped with Digital Storage Oscilloscopes,cathode-ray oscilloscope, Function generators & various kits for implementing and understanding Communication circuits/ techniques. Integrated Circuits lab comprises of Digital Electronics lab and Linear Integrated Circuits lab. The lab emphasizes on the basic components of digital electronics including op-amps, analog switches, different ICs, sample-and-hold circuit, ADC and DACs. All these components are pre fabricated on experiment modules, so students do not need to assemble anything manually. This laboratory is used to provide intensive practical exposure to the students in the field of microprocessor architecture and industrial control through them. Different exercises in this lab includes Serial Data Communication between PC and 8085 microprocessor trainer kit, writing on EPROM and microcontroller Chip using UIP. The lab also provides the facility to interface the microprocessor with different circuits such as A/D converters, stepper motors, DC motors, multidigit displays, etc. Microprocessor kit (8085), Microprocessor kit (8086), Microcontroller kit (8051), Interface boards, to name few, PPI, DMA Controller, Interrupt controller, Timer, ADC, DAC, Serial Communication, Stepper motor, Traffic control, Keyboard and display control , multimeter (digital), PC based interface, piggy back board, Oscilloscopes, Function generator, power supply, RS 232c cable & connector, two PCs. The Communications and Networking Laboratory in the Department is involved in research, education and scholarly activities in the broad area of communication networks and systems, with emphasis on theory, architecture, modeling, performance analysis, mutli-access, mobility, routing and switching, tele-traffic and protocols. The current areas of research focus include routing and path computation and optimal resource allocation in wireless networks, and high performance computer networks and applications. The Networking Laboratory is engaged in research and education in the area of wireless communication and networking protocols and algorithms, as to provide ubiquitous access to wired and wireless resources for mobile and multimedia users. The emphasis in our research has been on the ad-hoc networking technology, self-reconfigurable systems, and power-limited communication protocols. The Networking Lab investigates broad areas of wireless system design to meet these technical challenges. This Lab helps the student to get familiarizes with the fundamentals of electronics devices, PCB design and Fabrication techniques. This Lab is equipped with a wide range of Equipments, devices and software, which helps the students to practice electronics circuit assembly and testing and also provides a deep insight into the world of electronics practice. It is the skeleton of applied electronics. This lab is intended to practice and familiarize to identify the electronic components and to use basic electronic instruments. Student will be exposed to fundamentals of PCB design and various fabrication processes involved. Hand on training will be provided to enable the student to impart knowledge in assembling and testing of the PCB based electronic circuits. This Lab familiarizes the students with the fundamentals of electronic circuits. This Lab is equipped with a wide range of devices, which helps the students to undergo intensive training and provides a deep insight into the world of electronics. This Laboratory is primarily aimed to meet the requirements of practical work meant for Active Components basic analysis, designing and testing of Amplifier and Oscillators. All basic electronic devices and their characteristics, applications can be studied. Using these devices the small electronic circuits can be constructed and checked. In order to introduce the students with basic components of electronics, this lab is furnished with advanced CROs, function generators and digital multimeters. Students can perform practical on P-N junction diode, Zener Diode, rectifiers and filters, transistor biasing and their characteristics in different modes, RC coupled amplifiers and FETs.Guidance is provided to the students by a team of expert faculty and lab technicians. The labs are kept open after the college hours to enable the students to engage themselves in designing /testing the circuits in their leisure hours. The lab is used to train the students to implement the basic analog circuits (as a hardware using electronic components) and make experiments to get familiar with the characteristics of electronic components, test the circuit performance and the techniques of making hardware circuits. This laboratory is fully equipped with major equipments like Cathode Ray Oscilloscope and Function Generators, Voltmeters, A.C Milli Voltmeters, Ammeters, Analog Multimeter, Digital Multimeter, Dual Regulated DC Power Supply(Fixed), Dual Regulated DC Power Supply(variable), Single Regulated DC Power Supply(Fixed), Single Regulated DC Power Supply(variable), CRO (15MHz, 20MHz, 60MHz digital, 80MHz digital & 100MHz digital), Function Generator (1MHz, 2MHz, 3MHz), 3MHz Pulse Generator, Frequency Counter, 150McSource Meter, Auto Transformer (0-270V), Decade Resistance Box, Decade Capacitance Box, Decade Inductance Box, Rheostat (2200Ω/0.2Amp), LCR Q Meter, and Personal Computers. Most of the students of Electronics Engineering are exposed to Integrated Circuits (IC's) at a very basic level, involving SSI (small scale integration) circuits like logic gates or MSI (medium scale integration) circuits like multiplexers, parity encoders etc. But there is a lot bigger world out there involving miniaturization at levels so great, that a micrometer and a microsecond are literally considered huge! This is the world of VLSI - Very Large Scale Integration. The programming language used in this course isMATLAB, widely used for high-performance numerical computation and visualization.It has become easier toprovide the student with a practical environment toverify the concepts and the algorithms learnt in alecture course. Dept of ECE organized a national level Technical Symposium ECHELONZ'12 on 10th March 2012. Mr.S.Krishnakumar, Manager – Human Resources, QMax Group of Companies, Chennai was the chief guest of the function. Association Inaugural function for Academic Year 2012 – 2013 was held on 12th September 2012. 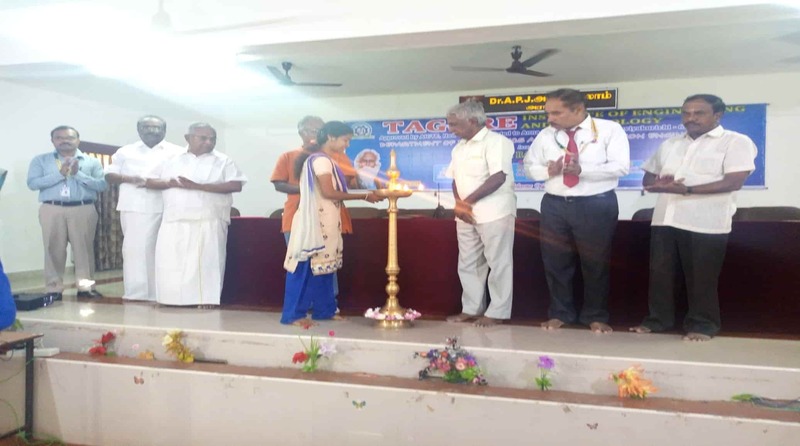 Dr.R.S.D.WahidaBanu, Principal, GCE, Salem was the chief guest. Dept of ECE organized a national level Technical Symposium ECHELONZ'13 on 15th March 2013. 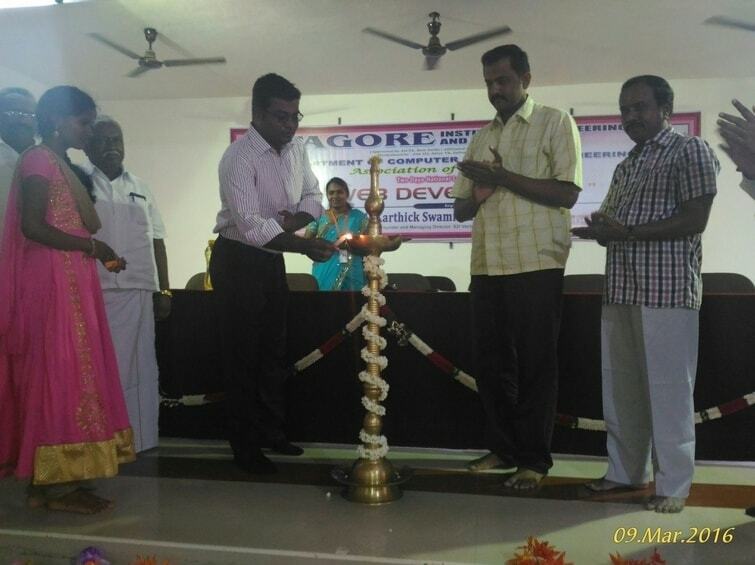 Dr.G.TholkappiaArasu, Principal, AVS Engineering College, Salem was the chief guest of the function. 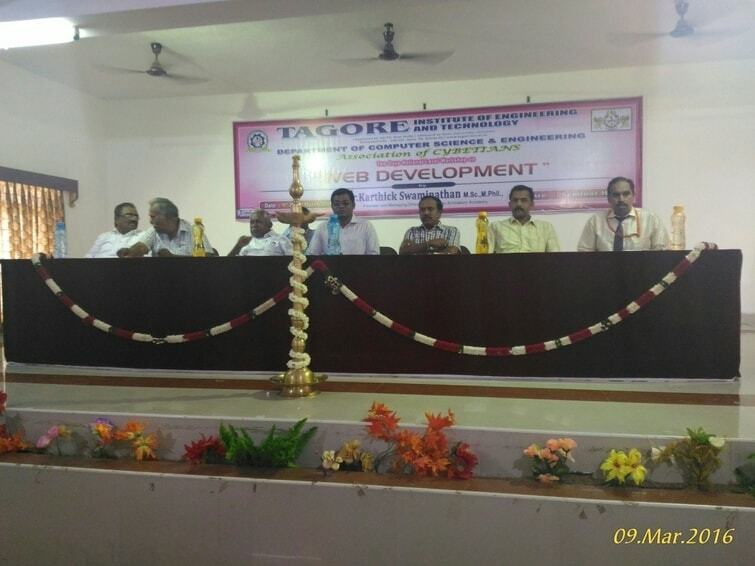 Association Inaugural function for Academic Year 2013 – 2014 was held on 05th August 2013. Mr.I.Nedumaran, Chief Manager, Neyveli Lignite Corporation was the chief guest. 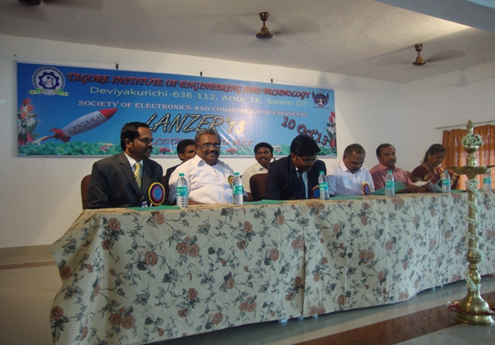 Dept of ECE organized a national level Technical Symposium LANZER'13 on 10th OCTOBER 2013. Students from many engineering colleges participated in this symposium and shared their ideas in the current trends. The various events are Paper Presentation, Circuit Debugging, Technical Quiz and Multimedia. Er.SivaNagarajan, Senior System Engineer, Infosys Pvt. Ltd., Chennai was the chief guest of the function. Valedictory and Farewell Function for the Academic Year 2013 – 2014 was held on 28th March 2014. Dr.P.Prakasam, Principal presides over the function. 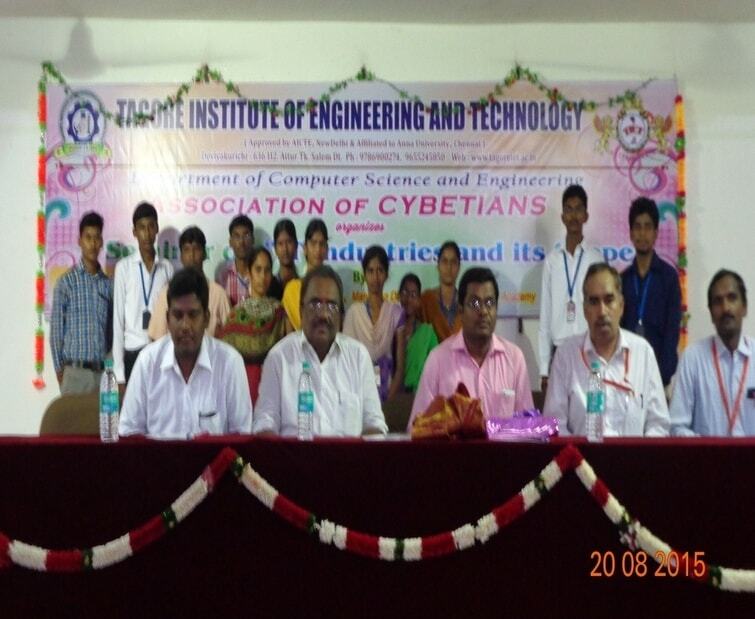 Association Inaugural function for Academic Year 2013 – 2014 was held on 04th September 2014 followed by a workshop on "Importance of measurements in electronic design". The resource person for workshop is Mr.V.Rajkumar, Assistant Manager, Test and Measurement Division, Sinetec Technologies, Coimbatore. The Department of CSE, ECE and EEE were conducted Association Inaugural Function on 21.08.17. The president Mr.R.Lakshminarayanan, vice president Mr.R.Chinnusamy, the secretary Mr.K.Arunkumar, joint secretary Mr.R.Muthusamy,treasurer Mr.Kaliyanan,the educational committee members Mr.R.Paramasivam, Mr.Kootroad .N.R.Palanivel were presided over the function. The Principal Dr.S.Senthilkumar delivered excellent speech on Future implementation of advanced technologies in circuit branches. The chief guest Dr.KALPANA.M.E., Ph.D, Professor and Head, Department of Computer Science Engineering, Government college of Engineering, Salem delivered lecture on recent trends in social networking. The Head of the department Mr.P.Rajesh Kumar introduced student office bearers in the academic year. The HODs from various department, Professors, Assistant professor, Lab technicians and students were participated in this event. The department of ECE conducted Workshop on ‘’Hands on training in Electronics” on 21.08.2017. The Resource person Mr.M.Parthiban, Mr.P.Viveendran & Mr.Ramesh Babu, Caliber Embedded Technologies, India (Pvt) Ltd, Salem and delivered seminar in this topic. The faculty members, Lab Technicians and students were attended this event from 12.00 p.m to 04.15 p.m. The Department of ECE was Inaugurated HAM RADIO CLUB on 06.02.18. The president Mr.R.Lakshminarayanan, vice president Mr.R.Chinnusamy, the secretary Mr.K.Arunkumar, joint secretary Mr.R.Muthusamy,treasurer Mr.Kaliyanan,the educational committee members Mr.R.Paramasivam, Mr.Kootroad .N.R.Palanivel were presided over the function. The Principal Dr.S.Senthilkumar delivered excellent speech on Future implementation of HAM RADIO CLUB. The chief guest S.VIJAYAN,VU2WP,NIAR Southern Region Co-Ordinator, Hydrabad., R.KARTHIKEYAN,VU3KEE,KCT,HAM Radio Club Incharge,Coimbatore., S.SHARAVANAN, Trustee, Wild Life And Nature Conservation Trust,Ooty delivered lecture on recent trends in HAM RADIO. The department of ECE conducted Seminar on “Embedded Systems with Advanced ARM Processor” in 06.08.2016. The Resource person Mr.Arun, Technical Engineer, MM Microtech, Chengalpattu delivered seminar in this topic. The faculty members, Lab Technicians and students were attended this event from 11 a.m to 12.30 p.m. The chief guest Mr.G.Tholkappia Arasu, AVS college of technology, Salem delivered lecture on Communication Skills and Placement training. The Head of the department Mr.P.Rajeshkumar introduced student office bearers in the academic year. The HODs from various department, Professors, Assistant professor, Lab technicians and students were participated in this event. The department of ECE conducted Workshop on “MATLAB and Advanced VLSI Design” in 23.09.2016. The Resource person Mr.R.Mani, MATLAB Developer and S.Dineshkumar Marketing Manager, CRISP, Salem. delivered seminar in this topic. The faculty members, Lab Technicians and students were attended this event from 10.15 a.m to 12.45 p.m. The Department of ECE conducted National level technical symposium function on 15.02.17. The president Mr.R.Lakshminarayanan, vice president Mr.R.Chinnusamy, the secretary Mr.K.Arunkumar, joint secretary Mr.R.Muthusamy,treasurer Mr.Kaliyanan,the educational committee members Mr.R.Paramasivam, Mr.Kootroad .N.R.Palanivel were presided over the function. The Principal Dr.S.Senthilkumar delivered excellent speech on Future implementation of advanced technologies in circuit branches. The chief guest Dr.K.Ganesan, Principal SRS college Engineering and technology, Salem delivered lecture on Digital India and job opportunities. The Head of the department Mr.P.Rajesh kumar delivered welcome address. The HODs from various department, Professors, Assistant professor, Lab technicians and students were participated in this event. The department of ECE organized “Radio Club Demo” on 17.04.2017. The Resource persons Mr.S.Vijayan ( NIAR, Southern Regional Coordinator, Hyderabad ), Mr.R.Karthikeyan ( Kumaraguru College of Technology HAM Club ), Mr.Sharavanan (Trustee, Wildlife & Nature Conservation Trust-WNCT, Salem) and Mr.Mohanraj (Co-ordinator-WNCT) delivered seminar in this topic. The faculty members, Lab Technicians and students of all departments were attended this event from 11 a.m to 01.00 p.m.
We have invested Rs.90 Lakhs for Lab Equipments in the Dept. of ECE. The Dept. of ECE organized a National Level Technical Symposium SILICA2K15 on 23 rd sep 2015. 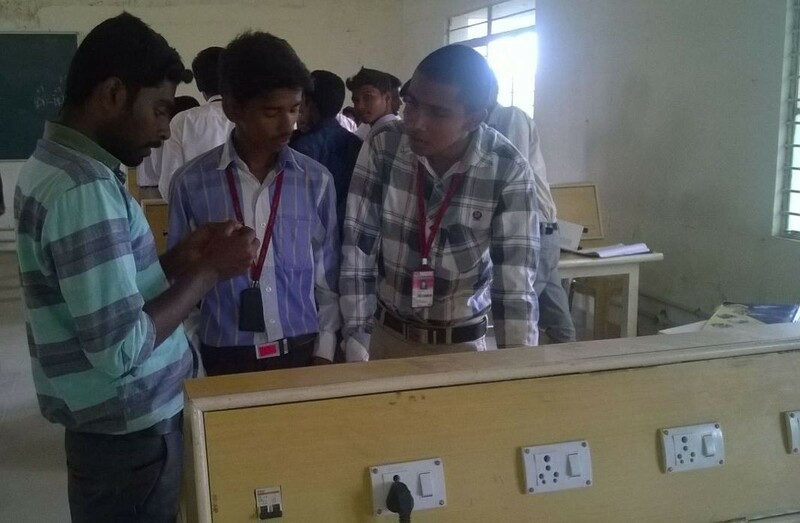 Our Staff member T.P.Anbumani has attended Embedded Systems FDP during 16th-18th December 2015 at Velalar College of Engineering and Technology. Our Staff Members E.Sangeetha, S.Arokiya raj, S.Saranya, T.P.Anbumani, J.Saranya, B.Sindhu and K.S.Natiyaa produced 100% result in 2015-16. K.Sujatha of IV ECE Student gotPlaced in Cognizant Tech Solutions conducted by Anna University Chennai. Our Students of IV ECE V.Hariharan P.Aravindhasamy, D.Durairaj, R.Gayathiri, K.Umayammal, U.Jansi, K.Sujatha, P.Sangeetha A.Kaushik got placed in IDBI. Our Dept. of ECE (B.E ) has arranged Industrial Visit to FM station at Kodaikanal,Deepanjan Power Cables, Mysore, Doddabetta Tea Factory, Coonoor, KELTRON Pvt., Ltd, Thiruvanandhapuram, ISRO, Trivandrum and Empower Global Solutions , Bangalore on 28.03.2015& 6.8.2015. N.Arumugam got 14th University Rank and Suganya got 42nd university rank in Anna University PG Examination. P.Aravindasamy, S.Vigneshwaran of IV ECE won the Ist Prize in Paper Presentation in National Level Technical Symposium. S.Vigneshwaran, A.Kaushik of IV ECE won the Ist Prize in Poster Presentation in National Level Technical Symposium. P.Aravindasamy R.Pavithra Devi of IV ECE won the IInt Prize in Paper Presentation in National Level Technical Symposium. M.Mounica of III ECE has won Third Prize In Circuit Debugging. 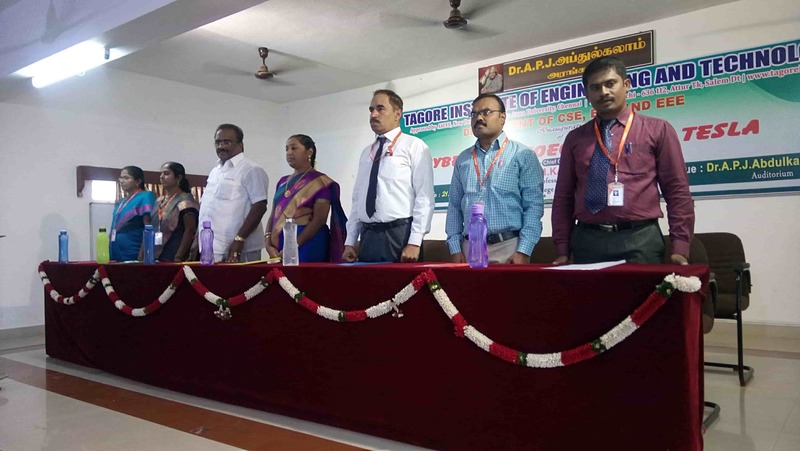 Our Students M.Mounica M.Keerthana S.Sangeetha, R.Elakiya K.Sowtharya S.Abirami M.Thirumoorthi J.Jagadeesan have attended Paper Presentation in National Level Technical Symposium. M.Keerthana S.Abirami of III ECE won the first Prize in Multimedia and Third Prize in Circuit Debugging. M.Thirumoorthi of III ECE won First Prize in Technical Quiz and Third Prize in Circuit Debugging. Students of ECE Visited UMS Technology Limited Coimbatore and Blue Apple Technologies Private Limited, Kerala. We have invested Rs. 90.5 Lakhs for Lab Equipments in the Department of ECE. The Department of ECE conducted a Seminar on “Embedded Systems with Advanced ARM Processor” on 6th August-2016. The ECE Department Association was inaugurated on 19th Aug-2016. The department of ECE conducted Workshop on “MATLAB and Advanced VLSI Design” on 23rd September-2016. The Dept. of ECE organized a National Level Technical Symposium ELEKTROACT’17 on 2nd February- 2017. Dr.S.Senthil Kumar Professor & Principal – published 5 papers in International Conference, 10 papers in National conference and 8 papers in referred Journal. Mr.P.Rajesh Kumar, HOD of ECE – published book in Electromagnetic Fields subject. Our Staff member Mrs.E.Sangeetha, published 1 paper in Middle-East Journal of Scientifc research in January-2017. Our Staff member Mr.S.Arokiaraj, published 1 paper in International Journal for Innovative research in science, Engineering and Technology in January-February’2017. Our department of ECE (BE & ME) has arranged Industrial visit to TRACO cable, Cochin on 22nd – 23rd July-2016. Our Staff members Mrs.E.Sangeetha,Mr.P.Thangarasu, Mr.T.P.Anbumani and Ms.S.Saranya have attended Industrial Seminar at Chips Software Systems, Ernakulam on 22nd July 2016. Our Staff members Mrs.B.Sindhu and Mr.T.P.Anbumani have attended FDP programme on “Wireless Communication” at M.Kumaraswamy college of Engineering,Karur on December-2016. Our Staff member Mr.S.Arokiaraj has attended ISRO sponsored National level seminar on “Research focus on Nano satellite Technology & its applications” at Paavai college of technology,17th March-2017. Mrs.E.Sangeetha, Ms.S.saranya, Mr.P.Thangarasu, Mr.T.P.Anbumani, Ms.K.S.Natiyaa and Mr.S.Arokiaraj got 100% results in 2016 Even semester. Mrs.E.Sangeetha,Mrs.B.Sindhu, Mr.T.P.Anbumani and Mr.S.Arokiaraj – got 100% results in 2016 odd semester. G.Abinaya, M.Mounica, J.Jagadeesan, S.Abirami, R.Elakkiya, M.Keerthana, K.Soundarya got placed in Hexaware technologies and Perfect technologies. R.Gangadevi got 41st University Rank in Anna University UG Examinations. 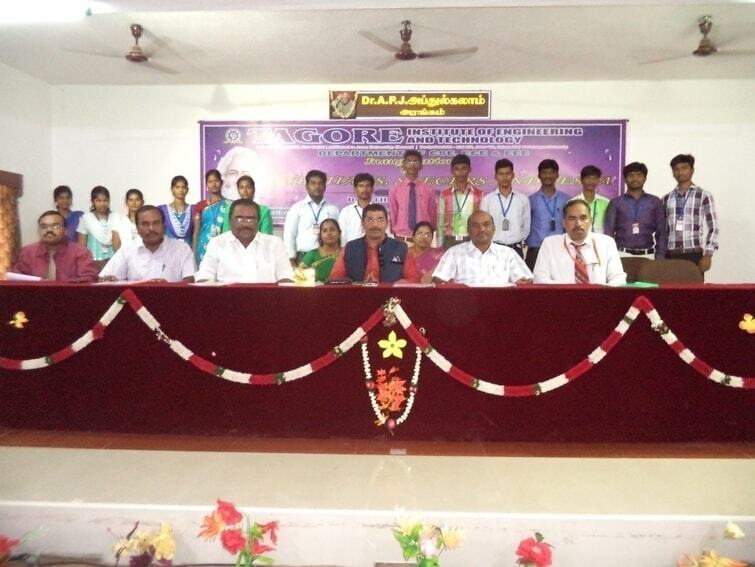 Our students S.Venkateswaran, P.Muthukumar and R.Prem kumar have attended workshop on “Digital Automation” in Government College of Engineering,Salem. Our students S.A.Surya,B.Reenathilagam,G.Gayathri have attended workshop on “Robotics” in Dhirajlal College of Engineering and Technology,Salem.